Tel Aviv PRIDE | Discover Israel on an extraordinary trip designed for LGBTQ community members and allies! Based on our flagship Israel Quest itinerary, you’ll experience the very best of this remarkable land while gaining insights into Israel's diverse and thriving gay community. Meet with local activists, spend extra time exploring Tel Aviv —Israel’s LGBTQ cultural capital, and bond with new North American and Israeli friends as part of a traveling community like none other! Organized in association with Keshet, a leader in the LGBTQ Jewish community. 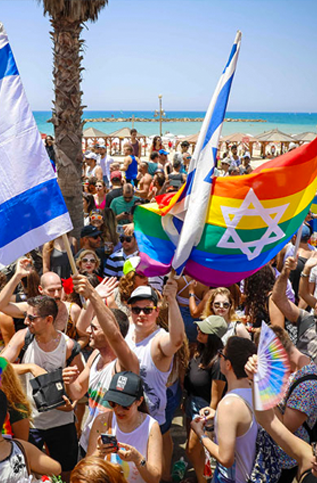 BONUS | Our summer trip features Tel Aviv's famous Pride Parade! You’ll be taken to the Birthright Israel website to register. Remember to select Israel Outdoors as your trip organizer! You’ll meet your group at one of our gateway airports and spend the night above the clouds — and headed to Israel. It won’t be easy, but try to get some rest for the journey ahead! Shalom! And welcome to Tel Aviv’s Ben Gurion Airport! Today you’ll meet your Israeli staff team and begin traveling north along the coast. Start with a welcome ceremony at the beach-side amphitheater in ancient Caesarea and then on to Haifa to see the beauty, grandeur, and inspired design of the Bahai Gardens on Mt. Carmel. Continue north for a view of the Kinneret, or the Sea of Galilee, from above. Spend the evening relaxing and getting to know your fellow travelers. Start the day off right with a hike on Mt. Meiron, the highest point in the Galilee and a mountain rich with history. Then wander through the mystical city of Tzfat where you will meet with a local Kabbalistic artist and enjoy free time walking the cobblestone streets and exploring the colorful artists colony. If you’re on a winter trip, you’ll visit the Hula Valley migratory bird sanctuary, and if it’s summer, get ready to cool down rafting the Jordan River. No matter the season, spend the evening unwinding at the Hamat Gader hot springs. Ascend the beautiful Golan Heights for a spectacular view of the region from Mt. Bental. Then the views get even more breathtaking as you hike down the water-filled Zavitan Canyon. Follow that with a fantastic tour (and tasting!) at the Golan Heights Winery. End the day traveling south to Jerusalem via the Jordan Valley (part of the great Syrian-Africa Rift Valley), where you’ll spend the evening getting acquainted with Jerusalem. It’s Shabbat in Jerusalem! If you choose, you can partake in a Shabbat service at a Jerusalem synagogue or celebrate the Day of Rest sleeping in. Enjoy a relaxed afternoon taking a walking tour of Jerusalem’s colorful neighborhoods and having some fun at a local park. End Shabbat with a Havdallah ceremony to mark the start of the new week. The stars are out now, and it’s time for a group night out to the famous Ben Yehuda Street pedestrian mall as Jerusalem comes alive. In the evening, you’ll spend time engaging in a mifgash (cross-cultural) discussion with the Israeli peers who join the journey while enjoying the pure desert air. Wake up long before the sun comes up for your pre-sunrise ascent to Masada via the Roman Ramp (it’s worth the early hours). Explore the desert mountaintop fortress, and then cool off swimming under the desert waterfalls at the Ein Gedi oasis reserve. And no trip to Israel is complete without a surreal float in the Dead Sea. You’ve got to feel it to believe it! Then travel westwards through the Negev Desert wilderness where you’ll get to ride a camel, enjoy a traditional hafla dinner feast, and then spend the night in an open-air Bedouin tent. Start the morning with a desert hike in Nahal Haverim canyon, and then visit the desert community of Sde Boker to learn about David Ben Gurion, Israel’s first prime minister, and his vision for a blossoming desert. Then experience the realization of Ben Gurion’s vision for yourself at Shvil Hasalat, the Salad Trail, an incredible desert farm where you’ll lunch on what you harvest. Continue north to the dynamic metropolis of Tel Aviv – Israel’s cultural and financial capital. Celebrate the spirit of Tel Aviv at the Nahalat Binyamin street festival and Carmel Market. End the evening with a night out in one of Tel Aviv’s trendy neighborhoods. Our final day in Israel begins learning about what it meant to establish the modern State of Israel at Independence Hall. And then reflect on Israel’s democratic ideals and future at the Rabin Square Memorial. Unwind with some well-deserved beach time in Tel Aviv followed by a walking tour of the historic Jaffa seaport, a model for co-existence in Israel. Our day concludes looking to the future with a visit to one of Tel Aviv’s innovative start-ups. Sadly, tonight is also your farewell dinner and closing session, where you’ll have a chance to process everything that you’ve experienced – and make plans to keep in touch with all the amazing people you’ve met on your 10 days in Israel. You’re flying over the sea now and back home after 10 amazing days with Israel Outdoors. During your time in Israel, you’ve been challenged by new ideas, discovered an extraordinary culture, and are returning home with a renewed understanding of your history. And once you’re home, there’s still more to discover. Explore your post-trip options. We know you’ll love the Israel Outdoors experience, but don’t just take our word for it. Check out these real reviews from past travelers who have completed the journey.